"What shall we do today?" I asked my boys yesterday. I was determined to do something. Saturday had been spent much like every Saturday - providing taxi services, cleaning the house, shopping and cooking. It had, of course, been a blazingly wonderful sunny day of extreme balminess and perfection. Sunday, naturally, was cloudy and threatened drizzle. Still, I could not let the entire weekend pass in a cloud of ironing steam and rubber gloves, so put my enticing question to the boys. My eldest came out with a predictable "Nothing" - it's his age - but my youngest suggested we visit a ruined castle. Not only was this rather a good idea, but he also had the exact castle in mind, seen when he had been flipping through my book of regional walks. He wanted to visit the Château de Fressac, about 55km north of Montpellier. The book showed a circular walk with a stem up to visit the castle. You could either do just the stem or just the circular walk or both. Knowing the boys, and being aware of the capriciousness of the weather, I thought we would probably just get to do the castle. I put together a picnic having nipped down to the village centre, bought a baguette, and a Festive baguette which is our top favourite type at the moment. This is because the crust is not thick or teeth-shattering, and the inside is light and airy. I had some charcuterie, and bought some cheese and tiny tomatoes. Thus armed, and taking along the Friend Who Reads, we jumped in the car, stopped off chez my TWDB to give him a kiss (he was feeling off), and drove up towards Quissac then Sauve. Veering off on ever smaller routes, we arrived at the hamlet of Fressac - a pretty little place full of stone houses, an impressive moulin (mill) and an impression of being well-preserved. The castle car park was indicated - an obligatory stop as there is no road up to the castle. It was 12.30 when we arrived so I asked the boys if they wanted to eat lunch then and there or at the castle. They opted for the castle, so also got to carry the picnic. The trek up took quite a toll. It was made up mostly of rough steps - small logs jammed across the path to prevent the stones behind from escaping - on a very steep slope. While the steps were a good thing to stop you from slipping, they were also very hard work. It took us 40mins to reach the top so we had definitely deserved our lunch. My youngest was dressed in his 'chain mail' tunic and helmet, and wielded his sword and shield like a true medieval knight. The other boys made do with a sword each, but all three leapt over the ruins, running about searching out all the nooks and crannies. It's an impressive structure, set high above the valley. 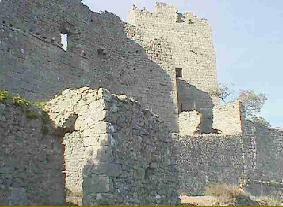 While the outside walls rise up a good ten metres or so, it is less preserved within. Fencing stopped them from climbing onto the ramparts, or was supposed to... My eldest did climb up, especially after he'd seen another boy do the same (and live to tell the tale). Apparently it's not somewhere that was ever inhabited, but served rather as a refuge when the peasants in the valley were being attacked. It doesn't have the tragic atmosphere of Cathar castles, but provided a good playground for boys who fought each other within an authentic 8th century backdrop. The views were not particularly spectacular because the weather was somewhat dismal, but the vines at the moment are resplendent in their autumnal glory and so the valley was a patchwork of different colours depending on the variety of vine. Some go a vivid red whilst others just dry out from green to brown. It must look stunning in the sun. After an hour or so, we felt the clouds descend, and small droplets of humidity started collecting on the plastic bag of apples. Time to go. It took much less time going down, the most entertaining part of which was seeing the poor sods on their way up, heading into the damp. We had got the best part of the day and the boys were well contented with their adventure. The Friend Who Reads thanked me very nicely and said he'd had the best afternoon, so he can come out with us again!